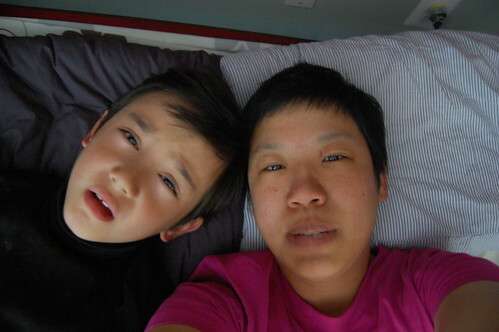 We are all sick (well except for Ruby, Jeremy and Eliana - but really, it's only a matter of time). I knew we were going to be sick this week because on the last day of our vacation we snuggled and played with our snuffly, coughing and slightly feverish cousins Felix and Ruben. There was really no way to reschedule the visit, nor did I want to cancel since it is so hard to see them, so here we are, all a bit ill. In addition to being sick, it's been kind of a crazy week. On Tuesday, I went with my friend Jane to the Alexandria Animal Shelter to put down her pet cat that she adopted four days earlier. It was a pretty emotionally draining experience, Jane is very tender-hearted when it comes to animals and it was very difficult for her to realize and come to the decision that Walter had health issues that were rapidly becoming worse and should be put to sleep and once she had decided that that was the right thing to do, she didn't want to go to the shelter alone. Needless to say, I did not go to work on Tuesday thinking that at the end of the day, I would be hold a cat paw in one hand and a friend's hand in the other. Jeremy's been doing a lot of the night-time sick childcare, and he's stayed home 2 days this week and he's feverishly working on an important report. I've been dragging myself to work because I'm taking this intensive Patent Law and Evidence Course which is hard to make-up. Anyhow - it's just how it goes. Hope everyone is getting better soon. I am hope you ALL feel better REAL soon! Comfortable bed and quiet moment during busy traveling schedule are important, especially with kids. May be, Mom and I are just getting old.